Home / MOBILE PHONES & DEVICES / Is Nokia preparing an 18-inch tablet? Nokia is back, and it looks like it wants to be a tough competitor for the brands that already were. The Nokia 6 is the first terminal that have launched, and is expected in the MWC in Barcelona we know the P1 , which aims to be the ‘flagship’ of the company for this year, with a very powerful hardware and price high-end. But the Finnish manufacturer does not want to stay there, it would also want, supposedly, to get into the field of tablets, and big. Nokia would be by taking a tablet around, presumably, and no less than 18.4 inch screen . Beside this gigantic panel, however, would also come very high specifications. 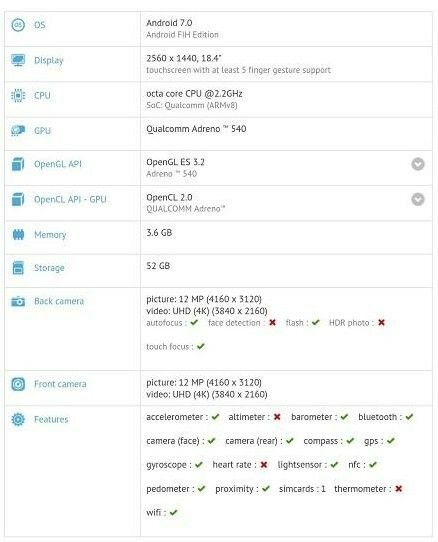 The specifications that supposedly would have the new Nokia tablet have appeared in GFXBench, and show, as we said, a screen size of 18.4 inches with a resolution of 2,560 x 1,440 pixels (QHD). This screen would also support five finger gestures. The chosen processor would be a Snapdragon 835 2.2GHz and would have a RAM of 4 GB. The storage, meanwhile, would be 64 GB. In the section on cameras count with front and rear sensors 12 MP capable of recording videos in 4K resolution and Android 7.0 execute Nougat factory. If all these specifications are true, Nokia may present this tablet next to what we know as Nokia P1 in the MWC and thus expand its catalog a little more with another high-end device. Is it a GFXBench error or will it really be an alternative to the Samsung Galaxy View? The first thing we want to ask for is a precaution since these are simple rumors that may change over the next few weeks. That being said, it would not be so rare that GFXBench was wrong with the screen size number by putting a 1 of more. If so, the device would have a screen 8.4 inches, a much more common and logical figure. If you have finally been an error known benchmark (which, apparently, would not be the first time that fails in a screen size), we would have a tablet quite normal and, moreover, would have a perfect specifications for those who They want to give cane to the video Juegos. But we must also look at the possibility that this may be the size of actual display, which would put him in range of the Samsung Galaxy View tablet, but with specifications very 2017 and priced to surpass with grow almost 700 € it costs now the ‘mega tablet’ Korean on Amazon. If we look at the positive side, if confirmed the 18.4-inch screen, it might be a good gadget for content and if it also has good sound, the experience could be very positive. Do you think GFXBench has screwed it up with screen size or could it be a reality?